LOS ANGELES -- After recovering from a computer problem, the Mars rover Curiosity is sidelined again, further delaying the restart of science experiments. The latest complication occurred over the weekend when the six-wheel rover entered safe mode after experiencing a software file error. Curiosity remained in contact with ground controllers, but it can't zap rocks, snap pictures or roam around until the problem is fixed. Rover team members had expected to resume activities Monday, but they now have to wait a bit longer -- perhaps until the end of the week. "We would definitely like to get over this and get back to doing something," said project manager Richard Cook of the NASA Jet Propulsion Laboratory, which operates the $2.5 billion mission. Studies at the Gale Crater landing site have been on hold since the beginning of March after engineers discovered a problem with Curiosity's computer memory, possibly caused by space radiation. The latest snafu isn't as serious, but any unexpected problem throws off the schedule, Cook said. It's the longest stretch of inactivity since Curiosity's daring touchdown near the Martian equator last year. 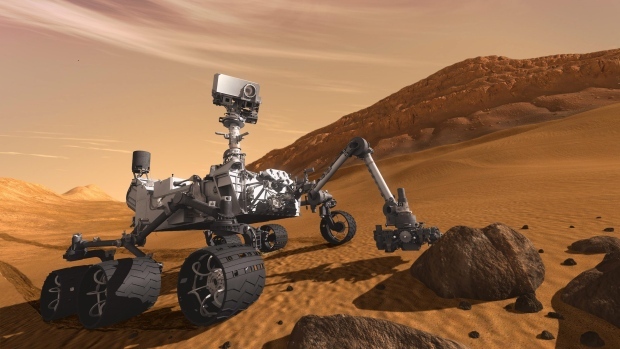 Just before halting its investigations, the nuclear-powered rover used the drill at the end of its 7-foot-long robotic arm to bore into a rock near where it landed and analyze the powder. Last week, scientists announced the results from the first drilling: Curiosity had discovered an ancient Martian environment that could have been favorable for primitive microbial life. Despite the excitement over achieving one of the mission's main goals, it has yet to find complex organic molecules considered the chemical building blocks of life. Once Curiosity returns to normal, it'll only have a few days to work before a planetary alignment limits radio communication between Earth and Mars during most of next month.